We are offering Biomass Briquette Machine to our client. Output Shape - Cylindrical, Rod, Square. Raw Materials include Groundnut Shell, Saw Dust, Sugarcane Bagasse, Cotton Stalks, Coffee Husk, Mustard stalks, Paddy Straw, Tea Waste, Bamboo Waste, Forest Waste etc. 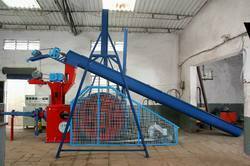 We are a top notch supplier of Biocoal Briquetting Machine. The first model developed by us that set off journey of technological excellence and innovation is super 60 model. This odel is supported by hammer mill to convert raw materials into powder form before it is suitable for achieving medium production capacity with minimum capital expenditure. Production capacity 1200 kg / hour.60 HP Motor.Zero Maintenance.3 Nos of Labor Required. With enriched domain experience and knowledge in the relevant field, we are manufacturing a wide assortment of Biomass Briquetting Machine. We are manufacturing Bio coal Briquetting Machine/plant. 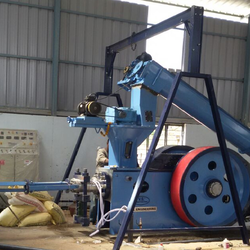 through this machine we can convert any type of agro/forestry waste into briquette form which is known as Bio Coal. These are also known as Biomass Briquette Plant, Biomass Coal Briquetting Plant and Agriculture Waste Biomass Briquetting Plants. JK Biofuel Machines Briquetting systems are robust & compact.